Have Toontrack improved their popular EZdrummer software without compromising its fundamental 'easy' approach? Several of the Sound On Sound staff, myself included, are regular users of Toontrack's EZdrummer, mainly because it does just about everything you might need without the complexity of Toontrack's flagship Superior Drummer. For those not familiar with EZdrummer, it is a comprehensive drum instrument plug-in supporting all the common Mac and Windows formats (and also enjoying a stand-alone mode) employing meticulously recorded drum multisamples that can be played from a keyboard, MIDI drum kit or from the included library of MIDI loops and fills. 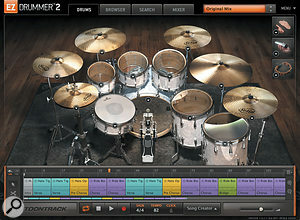 Its GUI is based around a graphical representation of the drum kit, a mixer The new main kit view, with arranger track along the bottom and percussion elements to the right. and the aforementioned library of MIDI loops. The 'EZ' (in the American sense) part comes from the simplified user interface, the learning curve of which is so flat you could climb it in carpet slippers. When we heard that Toontrack were going to rebuild the program and add new features, we were a little nervous that the changes might compromise the 'easy' aspect of the software. Fortunately, despite the added functionality, EZdrummer still remains 'easy' — and if you simply want to carry on using it much as before, you can jump right in and then explore the new elements at your leisure. EZdrummer 2 costs £99$149, with an upgrade price for existing EZdrummer users of £57$89. Also, anyone who bought EZdrummer after March 13th, 2014 gets a free upgrade (download only) added to their account. The original EZdrummer will remain on sale only as long as boxed copies last in the stores, and of course these can be upgraded free of charge. EZdrummer 2 retains the orginal's core framework and expands upon it, though some parts of the GUI have succumbed to what I call Apple-itis. In other words, they present grey text over a background of another shade of grey, which makes it harder to read in less-than-optimal lighting conditions. Additional EZX expander drum kits have been introduced at regular intervals since EZdrummer's launch in 2006 and can be purchased as add-ons, but although kits might include a choice of several different drum, cymbal and beater types, there was no way to assemble your own kit by combining elements from different expansion kits. This limitation, thankfully, no longer exists in version 2. Incidentally, if you take a snare drum from a different kit, the overhead mic component reflects this, so you don't end up in a compromise situation where the close-mic sound changes but the overhead sound stays the same — a common problem when doing conventional drum replacement. In addition to the ability to combine elements from different kits, the auditioning of instruments in a previously installed EZX expansion library (which were 16-bit files rather than the 18-bit files now used) has been streamlined, and the rewritten audio engine provides noticeably faster kit-loading times and real-time sample-rate conversion to match your session. 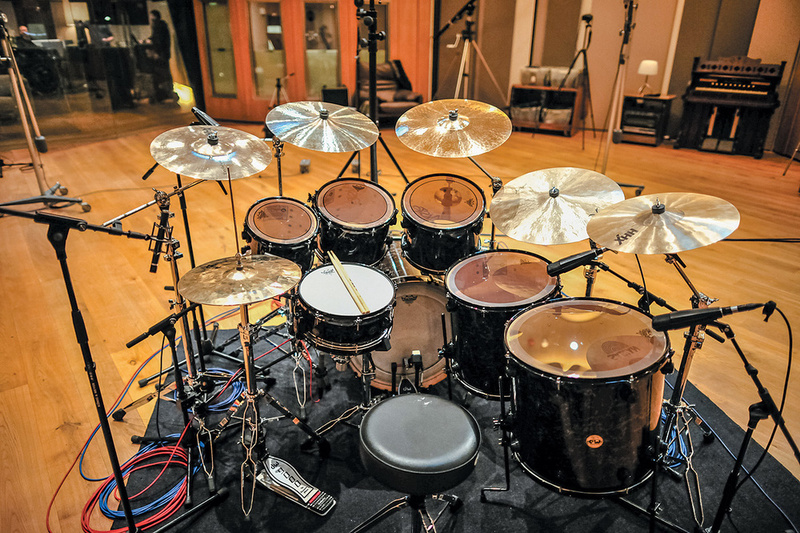 Other refinements relate to the way rapid successive hits behave — often a concern with tom fills — and improved The default Modern kit in EZdrummer is the DW kit in this picture, but this can be swapped out for a Gretsch or a Yamaha. compatibility with third-party MIDI drum kits. These 'engine room' improvements all happen behind the scenes and require no input from the user. Apparently the designers considered using 24-bit libraries, but found no advantage over 18-bit samples, which are dithered by the natural noise floor. This makes a considerable saving on RAM space without affecting sound quality. Though the operational paradigm remains essentially unchanged, the MIDI loop browser has been painstakingly indexed with metadata to allow the user to identify loops that are in a similar style to the one currently selected, or even to a rhythm tapped in using a mouse button or MIDI keyboard. There's also a new song 'track' area, where loops can be combined to make up a complete song arrangement before being exported to your DAW, although, as before, you can still drag and drop MIDI loops directly into your DAW if you prefer to work that way. One advantage of putting your drum parts together within the EZdrummer 2 Song Creator window, though, is that there is now the option to mix and match elements from different MIDI loops: you can, for example, opt to combine the kick and snare from one loop and the hi-hats from another. 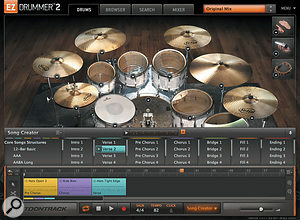 EZdrummer 2 comes with two new drum libraries labelled Vintage and Modern, which include drums from five complete kits plus several optional instruments. 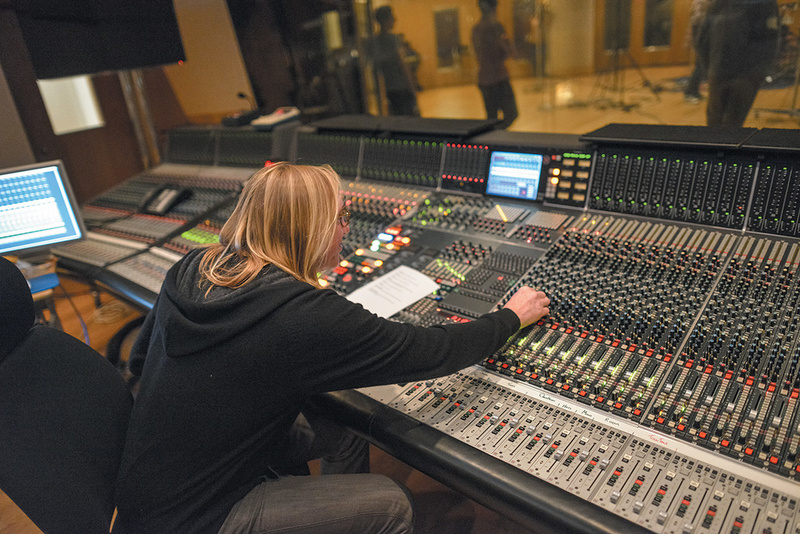 The Modern library includes drums from DW, Gretsch, Yamaha, Ludwig, Sonor, Tama and Brady, all recorded through Neve 88R and EMI TG12345 consoles as well as various vintage and modern outboard gear. The Vintage library is based around two classic Ludwig kits, recorded through a rare EMI REDD 5.1 desk. I attended a pre-launch press event at British Grove where the samples were originally recorded. The sampled kit was compared to the original kit, miked up exactly as it was for the sampling sessions, and there was virtually no difference, other than perhaps the kick in the sampled set sounding a touch tighter. 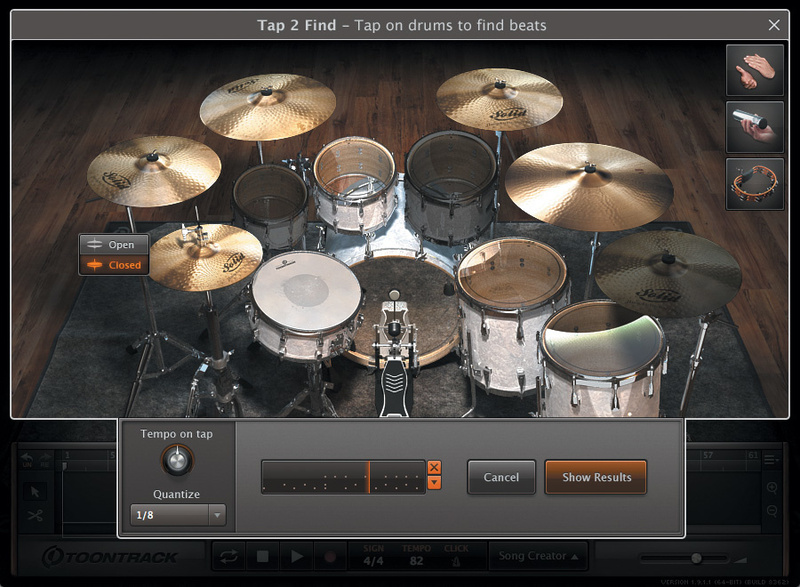 As before, you can click on any drum in the kit view to hear it, or use the drop-down menu on the drum head to chose from alternate sounds, and these same menus can now be used to navigate to the components in other expansion kits. My request to have the MIDI note (or notes) that are assigned to a drum also show up when you click on the drum has not been added yet, although the Toontrack engineers haven't ruled it out for a future update, and are generally very responsive to user suggestions. There are other ways to interrogate the kit mapping as seen alongside a keyboard view, but seeing the relevant note or notes right there on the drum head could make life easier. New in the drop-down drum part menus are velocity and tuning controls for the respective drums and cymbals, as well as an area that lets you click to play all the different velocity articulations. The main menu button accesses MIDI settings and the manual, as well as mapping presets for popular electronic drum kits, including Roland's V-Drums. Toontrack have also added effect chains, as well as a selection of percussion instruments that can be added to the main kit — though I'm still waiting for rototoms! If you already have the original EZdrummer, its included kits also show up in EZdrummer 2, as do any existing EZX expansion kits, though I'm told by Toontrack that the entire line of EZXs are due to be modernised with completely new effect chains and graphics optimised for EZdrummer 2. 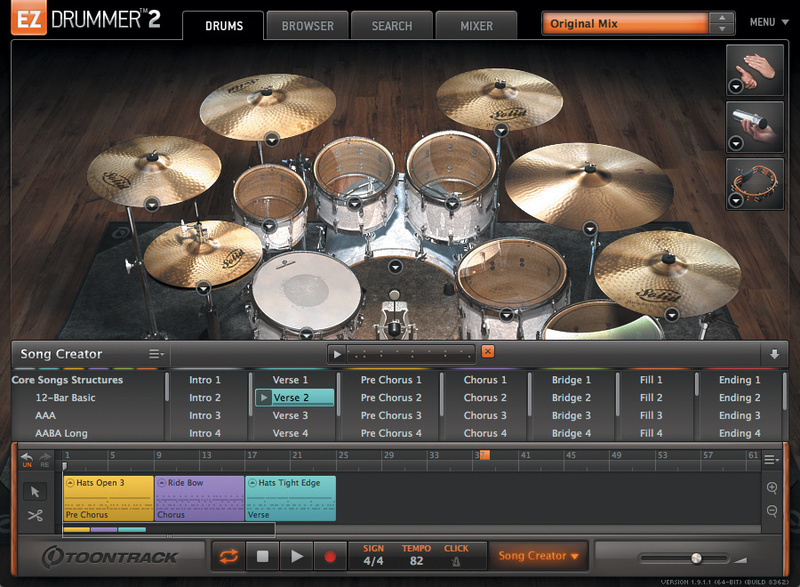 EZdrummer 2's main screen can be switched to provide four different views by using tabs labelled Drums, Browser, Search and Mixer, while the song track where you can assemble your own song parts is always visible at the bottom of the screen. This is styled very much along the lines of a typical DAW track (and indeed Toontrack's own EZKeys), with bar/beat markers, transport controls and the option to set loops. You can either set your own tempo or click the Follow Host button. There's also an overall level slider and a pair of undo/redo buttons, as well as a menu of operations. To the right of the screen are the small percussion windows, where you can add things like cowbell, claps, shakers and tambourines. The complexity of the added part when using library loops is controllable via the Amount knob in the Edit Play Style window, and alternate percussion sounds can be selected via a small drop-down menu related to each instrument icon. 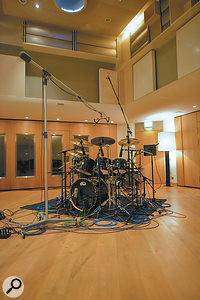 The kits for EZdrummer 2 were recorded by Grammy Award-winnning producer/engineer Chuck Ainley using the Neve 88R at British Grove Studios, London.There are also velocity-dependent articulations for the shakers and tambourines. According to the designers, the percussion pads are 'a bit special' when it comes to how they handle MIDI. The One Shots pad is on MIDI note 1 (bottom C sharp) and can be played normally, but due to the nature of instruments such as tambourines and shakers (Note 2 and 3) where the 'hit' transient is preceded by 'build-up' sounds, it is a bit tricky to program them manually so that their timing sounds natural, which is why EZdrummer 2 includes a number of pre-programmed MIDI loops that take this into account. Timing is taken care of by something Toontrack call Future Hit Technology, which uses Note On messages to start the pre-hit sound and the Note Off to time the actual hit. Apparently this technique is also used for the brush sweeps in the Roots Brushes SDX kit. EZdrummer's kits and expanders have always come with a library of MIDI loops and fills, but the Browser part of the program has had a massive overhaul. The groove library will look familiar to existing EZdrummer users, with categories for styles, time signatures, intros, fills and so on. There are also style filters that allow you to browse loops by genre, which is important given that there can be tens of thousands of MIDI loops in there if you have all the expansion kits installed. It is also important to note that some loops are several bars long, and so vary in a more realistic way than loops that use the same bar or two over and over again. The Search tab brings up one of the new features I mentioned before: Tap2Find allows you to tap out a rhythm against a click using a MIDI keyboard or by clicking on a drum in the Kit window. You can build up your template pattern in layers, including adding an open or closed hi-hat, and everything gets neatly quantised. EZdrummer 2 then lists the library grooves that are similar in some way, in order of how well they match up. This part of the program works extremely well, and even where its choices might not be exactly what you're looking for, they're often close enough to edit. User loops or edited library loops may then be stored in the user area for future use. The song track is essentially a drag-and-drop area into which you can string together MIDI loops and fills to form a complete song arrangement, all of which is assisted by the program's ability to suggest compatible grooves to go along with the ones already chosen. Clicking the Song Creator button opens up another section above the song track with a slot into which you can drag any of the library loops so that similar loops can be suggested. These are all displayed below with a matching value: the higher the number, the better the match. Loops may be shortened, copied and moved to leave spaces if needed, but there's no piano-roll editor, so anything more surgical needs to be done in your DAW. You can, however, select and remove kit pieces from a loop and then copy in selected parts from other loops in the browser to create new 'hybrid' loops. Material assembled here can be played back at the host song's tempo and song position, or at a user-selected tempo. There are also song arrangement templates that can help speed up the songwriting process, so if you need a 12-bar blues backing you'll find one there. Of course, prefabricated loops are sometimes too busy or too laid-back, so Toontrack have added controls that allow you to modify the way the loops play in a very intuitive way, and because the loops are individual hits controlled by MIDI, there's no compromise in sound quality regardless of how fast or slow they are played back. In fact there The mixer now includes its own effects. When these are applied to the mixed output, some clever behind-the-scenes intelligence applies them proportionally to the different sources, so you'll generally get what you intended without having to delve into the details yourself. are several novel features that let you interact with the stock grooves, such as the Power Hand. Click on a groove in the song track and a kit view opens up, and you can drag the Power Hand pointer over any kit component to change the leading instrument for that loop. For example, you may wish to change the ride cymbal to a hi-hat or even a floor tom. Clicking the menu arrow to the right in the Power Hand sign makes it possible to choose between all the different articulations for the selected instrument. Percussion elements can be turned on or off and, like the other drums, also respond to the Amount and Velocity controls available on that page to make them more or less busy. You can also set what type of cymbal hit should introduce the loop, but if you don't want one you can turn it off by clicking the orange 'power button' on the Opening Hit sign. All these settings remain specific to the loop you're editing so you can create a nice build-up by using the same loop several times but by making it busier and louder each time around. The Amount control may be used to simplify loops by removing the hits that a real drummer would tend to leave out, and this works on a per-drum basis rather than by treating the loop as a whole. That means you can, for example, simplify just the ride-cymbal pattern or the added percussion without changing the rest of the loop, if that's all that's needed. Conversely, you can go in the opposite direction and force the loop to add in parts that weren't originally included, again guided by an algorithm that emulates what a real drummer might do. There's also the option to adjust the velocity of either individual drums or the entire kit, likewise with a touch of artificial drummer intelligence to keep it sounding real. Then there's the aforementioned ability to combine parts from different loops, which is a great way to get a The new Song Creator mode suggests related patterns to help keep your focus on creativity rather than navigating the library. lot more mileage out of the already impressive collection of loops. When you're done tweaking, you can save the result as a user loop and drag the whole song part you've created into a DAW track as MIDI, or pre-render it as audio if that is what you prefer. The MIDI data in the track view is updated as you edit, so if you drag loops or songs to your DAW without saving first, you still get the benefits of any edits you've done. Like the original, EZdrummer 2 can operate as a simple stereo-output device, or you can invoke separate outputs to allow processing via other plug-ins. Thanks to the built-in mixer, the former is often all that you need. 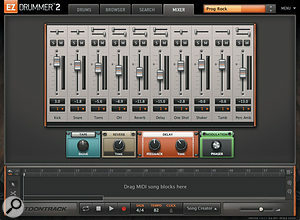 The ability to adjust both close and distant mics in the mixer has always allowed the user a wide range of control over how EZdrummer's kits actually sound, but in version 2, this has been taken further by the use of processing presets based around the algorithms employed in Toontrack's EZmix 2 software, whose chains can include things like compressors, reverbs, delays and equalisation. Depending on which preset you choose, the same kit can sound very different, as the presets also include different drum decay times. There's also pitch control for the drum heads and the cymbals, as well as variable mic bleed. Now that there are several preset versions of each kit, each with different types of processing, the exact number of mixer faders and the types of effects processors often varies as you change presets, but a typical layout might include close mics for all the drums with a separate under-snare mic, overhead mics, room ambience mics, percussion elements and sometimes compressed room mics or parallel compression channels. 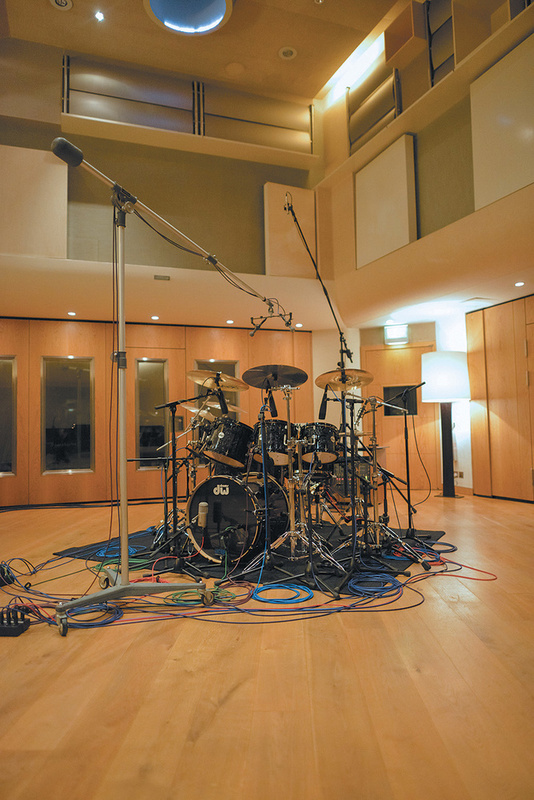 Vintage-style kits usually have fewer mics, to reflect how drums were recorded 'back in the day'. Even so, the processors have very few controls (usually just one or two each), so using them is extremely straightforward. 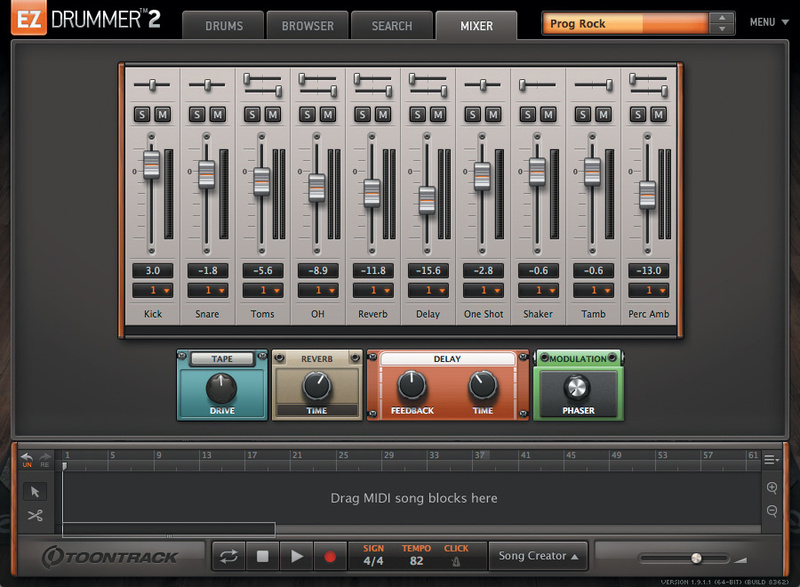 In all, EZdrummer 2's core libraries include 29 different user-controllable effects chain presets. There was no actual manual when I started this review, but a little speculative button pushing soon uncovered the new features, so I expect the learning curve to be even flatter once the full manual is finished at the time of release. The presence of Not sure which loop to audition? Tap out your basic rhythm and Tap2Find will show you the ones that match. 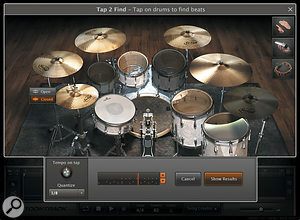 the song track at the bottom of each window gives the program a slightly different look, and the new drum kits also have an updated visual style, but if you want to pick up where you left off with EZdrummer, you can work in exactly the same way without any of the new features tripping you up. Another big bonus, at least for me, is that the Roland drum mapping now allows my V-Drum hi-hats to produce usable results with EZdrummer 2, and though all the finer nuances of hi-hat pressure seem to be ignored, at least the open, closed and pedal modes now translate correctly. On the subject of sound, I have to say that the two new kits sound superb, with lots of snare and cymbal articulations to keep things sounding natural. Having the option to add percussion is useful, and being able to mix and match items from different kits is also a big deal. It's also good to see kit presets based on both different mixer and processor settings, as this really opens up the range of sounds you can coax from a single kit. Similarly, the work that has gone into categorising all the loops in the loop browser must have kept somebody very busy, but it has paid off in making it much easier to find loops that will work together in the same song. The option to tap in a rhythm and then get the browser to find a match for what you've played is also a clever innovation, and one that really works. 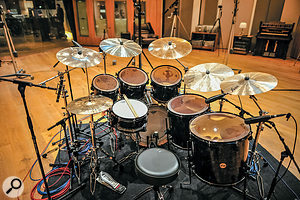 The idea of tools that can intelligently adjust the complexity of drum parts isn't entirely new, but Toontrack's implementation of it works in a musically credible way, as does the Power Hand for letting you change what Toontrack call the 'lead' instrument — typically a hi-hat or ride cymbal. The way they have built on the existing EZdrummer paradigm makes the switchover easy, though there's still room for a couple of little improvements in future versions. I've already mentioned that when I click on a drum to hear it I'd also like it to display the MIDI notes assigned to triggering it, and I've also hinted that I'd like to see a set of rototoms added to the percussion section. It might also be beneficial to have a sub-oscillator fader in each mixer with a pitch and decay control for underpinning kick drums, but this would really be the icing on the cake. The new features are genuinely useful, not only in extending the range of sounds that can be teased from the various kits and combinations, The number of miking options and the quality of the 'bleed' or spill added by a nice acoustic space allow the creation of very realistic-sounding drum parts. but also in making it much easier to select or combine elements from loops in the library. It is a credit to Toontrack that they have introduced such a massive upgrade without any of the improvements conflicting with existing EZdrummer working methods. All in all, the affordability of EZdrummer 2 and its spectacularly 'real' sound quality make it a remarkably effective alternative to miking up a real drum kit — which is always a compromise in smaller home studios — or replacing recorded drum tracks with samples. There are a huge number of virtual drum instruments available today, many of which were rounded up in the previous issue of SOS: /sos/apr14/articles/spotlight-0414.htm. Like Paul, I've been an EZdrummer user since its launch in 2006 and although I make a point of exploring every new product of this type I come across, I've stuck with EZdrummer for all my composition work. I like the fact that its individual drum sounds are already 'part-produced' with appropriate damping and EQ already in place. In other words, the 'heavy lifting' has already been done, leaving me to concentrate on a final tune-up and polish to fit the sound to the context in which I am using it. I like that the mixing options are usually no greater than I would typically use on a mix with a real kit: usually just close mics, overheads, a room pair and a more distant compressed room. And I like the very intuitive structure of the library, with genres flowing into kick and snare patterns of increasing complexity and then finally into hi-hat and ride options. In fact, I like it all so much just as it is that I too was slightly worried when I learned that there was an EZdrummer 2 on the horizon. All too many software products seem to reach a state of perfect refinement and adaptation, only to be ruined by ill-conceived 'all-singing, all-dancing' updates that render them less well targeted and less usable for any form of serious work (Logic X springs readily to mind as a recent example). Enhanced usability without becoming overly complicated. Works with existing EZX libraries. Improved mapping for electronic drum kits. I can find no obvious cons, though there is the opportunity to add a few refinements in the future, such as a better way of interrogating the MIDI mapping and perhaps a wider choice of added percussion. 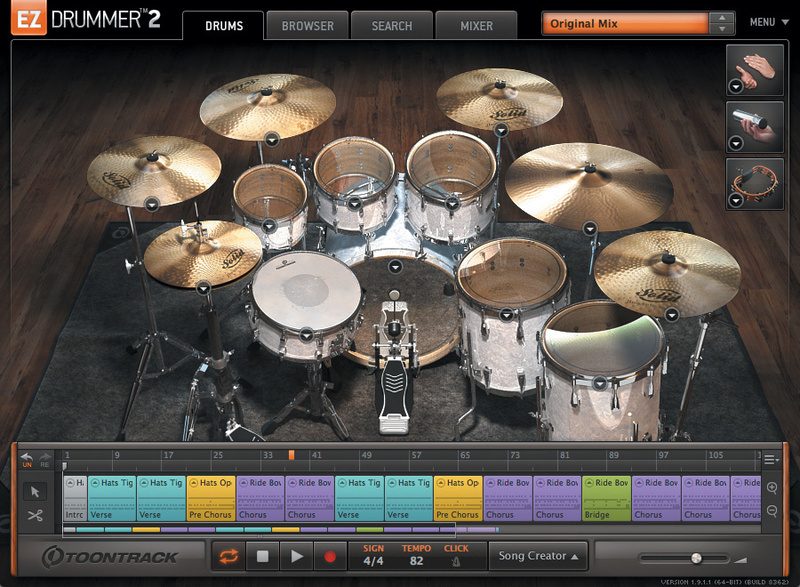 EZdrummer 2 represents a significant and worthwhile upgrade to what was already an excellent drum instrument. £99 including VAT. Upgrade from EZdrummer £57. $149. Upgrade from EZdrummer $89.